Two professors and two contrasting religious views came together at Ohio State’s Mershon Auditorium on February 24, 2016. The venue was packed with hundreds of students, professors, and families. Hosted by the Veritas Forum, philosophy professors William Lane Craig and Kevin Sharp tackle an important spiritual question – is there evidence for a God? Dr. Craig started the debate from a Christian perspective. Accordin g to Craig, God explains why anything exists – the universe, math, fine-tuning of the universe for life, and objective morals. Sharp contradicts his view from an atheist perspective, asking how confident Christians were in their arguments for God. Sharp argues that simple confidence is a weak reason to believe in God; Christians need more than just confidence for a strong argument. Sharp claims that it is almost impossible to determine God’s reasoning, and that all people – including atheists – have moral values. Sharp says there is no magical dividing line between biology and religion; this contrasts Craig’s argument that God specifically designed biological creation. Sharp also says that theism causes hate; for example, many Christians cherry-pick verses to support their own intolerable opinions. To counter these points, Craig argues that atheists cannot prove that God didn’t fine-tune creation. He argues for non-reductive rationalism; that things like spiritual values can’t be explained in terms of science. To this, Sharp claims that God condemning people to Hell contradicts Craig’s claim of a loving God, and urges students to be critical and forge their own religious beliefs rather than borrowing from others. From the beginning, Dr. Craig gained the crowd’s favor with his gentle, demure personality. Dr. Sharp came off as abrasive and rude in his arguments, while Dr. Craig remained collected and calm. After many of his rebuttals to Dr. Sharp, the audience would cheer at his answers. The forum did an excellent job of providing a neutral, unbiased space for a peaceful debate. While the ultimate question of evidence for a theistic God remains subjective, it was interesting to hear atheist and Christian professors duke it out over the topic for an hour. I had the pleasure of attending the April luncheon titled The 16 Strivings for God with Dr. Steven Reiss – hosted by the Fellowship of Christian Faculty and Staff. During the luncheon, Dr. Reiss discussed his accomplishments including his role in the establishment of the Anxiety Sensitivity Index (ASI), his two books, and the Reiss Profile. 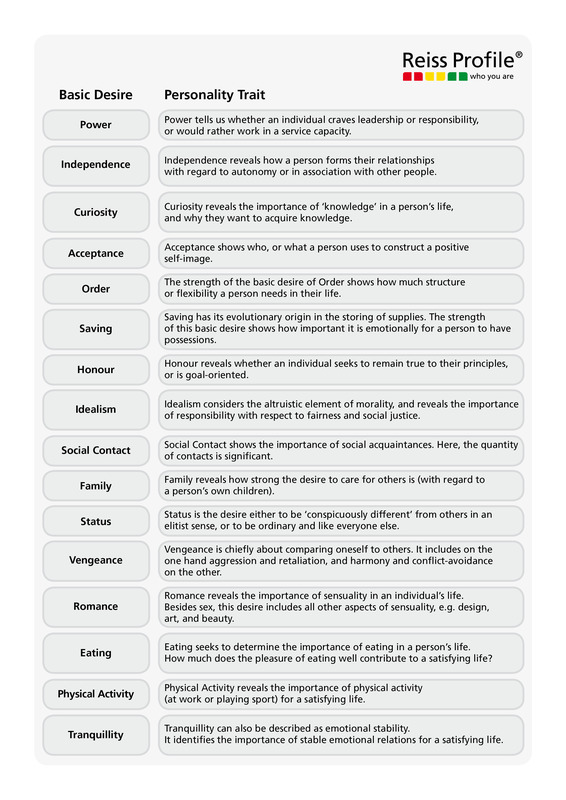 His theory on the 16 Basic Desires of Human Nature provides a testable method on which to analyze religion in a psychological sense rather than theologically. Although Dr. Reiss stated that he does not identify with any Religion, he did admit that Religion promotes inclusion and allows people to transcend their separations. This notion reinforces the role that Religion may have in mitigating environmental degradation that has been discussed in class. In other words, by having people from difficult faith communities find common ground, similar goals may be realized and acted upon in solidarity. The Veritas Forum: Is There Evidence for God? The Ohio State University hosted an intelligent conversation between two renowned philosophers in front of a capacity crowd at Mershon Auditorium. The Veritas Forum, a global organization, has come to OSU annually to address difficult questions by hearing two opposing viewpoints. Speakers Kevin Scharp, an OSU philosophy professor and atheist, and William Lane Craig, a Christian apologist, addressed the question, “Is there evidence for god?” The format of the event consisted of both speakers presenting their respective stances in a short talk, followed by questions from the moderator and concluding with a Q&A session with the audience. The full event video can be found at the end of the post. Belief and confidence levels are related and cannot be discounted. A belief must hold a high confidence level and exceed a predetermined threshold of confidence. General beliefs are not the same as particular beliefs. 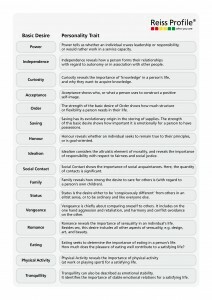 Weak beliefs cannot be used to reach the same conclusions as strong beliefs. I think this event was a wonderful time of discussion. The speakers challenged each other and the audience was left with much food for thought. It is difficult to maintain civility and rationality when such weighty and personal beliefs are being discussed; this event was, save for a few moments, an extremely healthy and productive environment. Check out the video of the event below! Today (4/20/16), I attended the Climate Action Rally that was held at the Statehouse in Columbus, Ohio. This event was organized and ran by the Climate Action Coalition with help and sponsorship through organizations like Ohio Interfaith Power and Light as well as Simply Living. 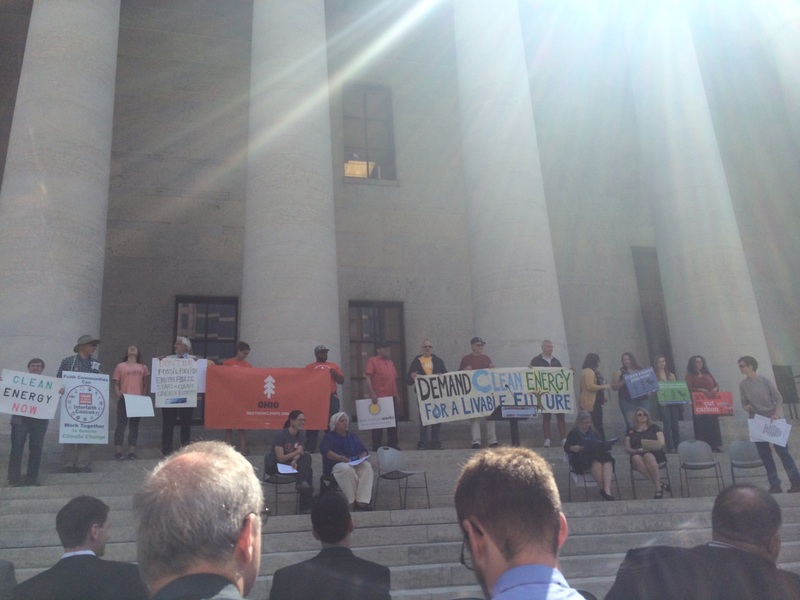 The Rally included different speakers about a “freeze” that has possibly been put on by the State of Ohio’s legislature in regards towards action surrounding climate change policy. The speakers represented a variety of religious backgrounds ranging from Judaism, Catholicism, and various sects of Christianity. Despite the difference in particular religious beliefs amongst the speakers, a common theme emerged around how we all had a moral responsibility towards taking actions in response to climate change. This theme resonated well with recent events in the field of religion and the environment with the most influential being Pope Francis’ Encyclical on the Environment, Laudato si’. It is this Encyclical that sets the framework for not just Catholics to follow, but all people. Events like this Rally today show the support and efforts people have towards the not only religious beliefs but also environmental care. GoodLands has created a map to show the Catholic Church that they have the influence and power to implement environmentally conscious property use in the United States and beyond. This map includes 92% of listed Catholic-affiliate properties in the Official Catholic Directory from 2015. When you click on a point on the map, you can learn about the property and its surrounding land use and habitat. To view the map, click here. GoodLands is an organization that provides information, insights, and implementation tools for the Catholic Church to promote caring for creation, serving the poor, and improving the state of the world. Their main goal is to help the Church develop a deeper geospatial understanding of itself and to use this towards the Church’s mission to care for all creation. They are working towards a vision where Catholic conservation and sustainability can become the largest non-governmental global network of its kind, comparable to Catholic healthcare and Catholic education. To view their entire website, click here.